A report, dated March 16, 2010, by the Western Association of Fish and Wildlife Agencies, Wild Sheep Working Group, summarizes the recent outbreaks of pneumonia in bighorn sheep that have occurred in Montana, Nevada, Washington, Utah, Wyoming, and South Dakota. Domestic sheep and goats are also known to be in close proximity to, and are suspected to have interacted with, bighorn sheep in many of the areas where outbreaks have killed hundreds of wild sheep region-wide. Contrary to recent reports in the media, there have been confirmed interactions between bighorn and domestic sheep associated with at least one of these outbreaks. Most notably there has been confirmed interaction in Montana where there have been severe outbreaks of pneumonia. The report outlines many of the actions taken by the state agencies and what testing has been done. Many of the tests are still being conducted on samples from bighorn and domestic sheep and no conclusive results have been announced. It cannot be said that there has been no interaction between domestic and wild sheep. At the same time it cannot be said for certain that interaction has been the cause of all or any of these outbreaks, however there is overwhelming evidence that interaction between domestic sheep and goats results in widespread and rapid die-offs of bighorn sheep. In 2007 the WAFWA Wild Sheep Working Group was created to give guidance to state, federal, and provincial agencies on how to manage domestic sheep and goats in wild sheep habitat. They produced a report to the agencies in June of 2007 but none of the recommendations have been implemented by the BLM or Forest Service. 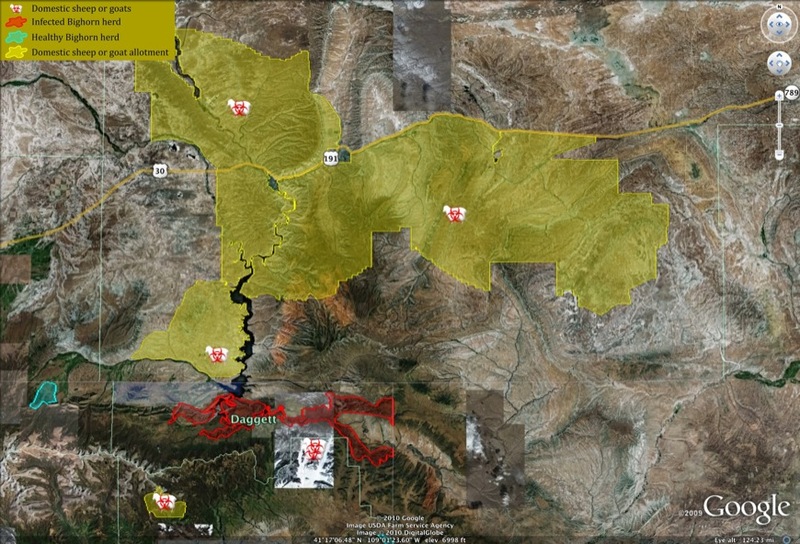 There are still numerous conflicts on the ground where domestic sheep and goat grazing is allowed within occupied bighorn sheep throughout the west. 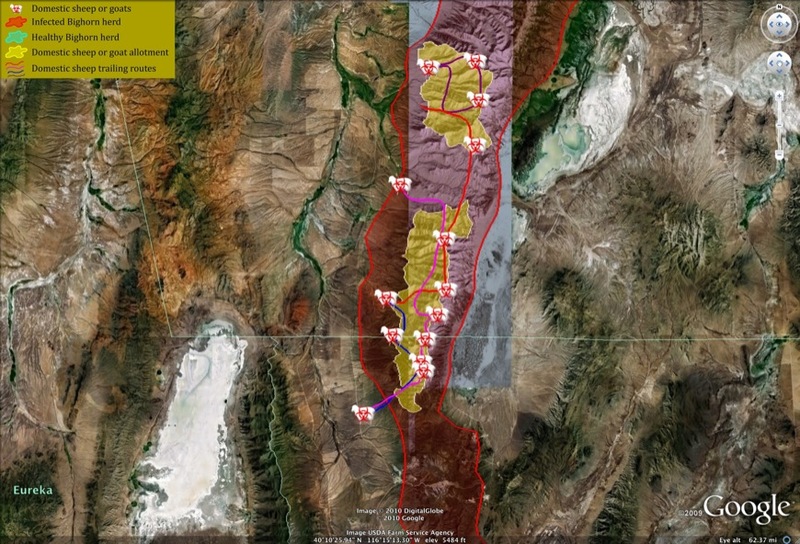 In some cases these conflicts have resulted in litigation and changes to land management plans are underway. It is time for the BLM and Forest Service to implement strict guidelines which maintain separation between bighorn sheep and domestic sheep and goats. At minimum, permits for grazing and trailing sheep and goats on Federal lands in occupied bighorn habitats should be withdrawn. Farm flocks on private lands deserve some attention too. Programs for educating owners of farm flocks should be created and in some cases effective fencing to eliminate contact between the two should be offered or even required in areas where bighorn sheep are of high conservation value. In Montana, where up to 1000 bighorns (or 1/6th of the state’s population) may have been affected by the outbreak, hobby/farm flocks of domestic sheep and goats occur in many areas nearby bighorn sheep and one farm flock of domestic sheep near Sula, MT is being tested. The results of the testing have not been reported yet. So far the Bonner, EF Bitterroot, Lower Rock Creek, and Upper Rock Creek herds of bighorn have been culled by Fish Wildlife and Parks and untold numbers of bighorn have died from pneumonia as well. In Nevada, 88 bighorn sheep and one mountain goat have been found to have died from pneumonia in the Ruby and East Humboldt Mountains near Wells, NV. Surrounding the base of the mountains are several farm flocks of domestic sheep and goats. 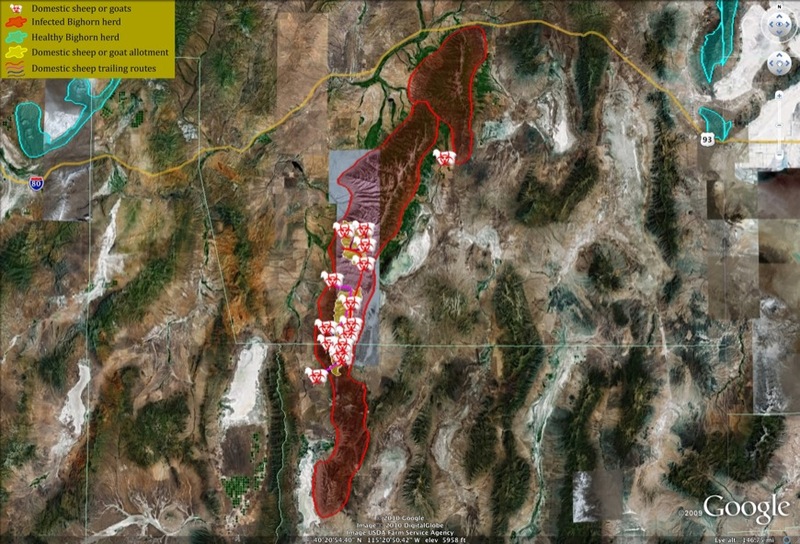 The Forest Service has allowed domestic sheep grazing within the Ruby Mountains and domestic sheep have been used for “fuels management” nearby as well. 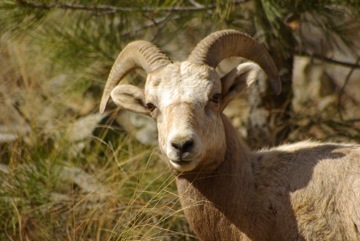 Domestic sheep have also been observed in bighorn summer range. In past years there have been documented contact between domestic goats and bighorn on private lands in the East Humboldts. There were also reports of coughing bighorn sheep in the Clan Alpine Range of Nevada which hasn’t resulted in any die-off or widespread disease outbreak. In Washington, bighorn sheep in the Yakima River Canyon were observed coughing and at least 70 of the 260 bighorn have either died from the disease or have been culled by WDFW. The cause of the epidemic has been determined to be Mycoplasma ovipneumoniae which was found in all of the infected sheep. There are hobby/farm flocks of domestic sheep at the northern and southern ends of the Yakima River Canyon but there has been no confirmed interaction between the two. In Utah, sheep were seen coughing near Goslin, Utah. Tests were done on samples and both Mycoplasma and Pasteurella have been found. The UTDWR plans to kill all of the 40-60 bighorn sheep which were introduced from Montana herds in 2004 and 2007. 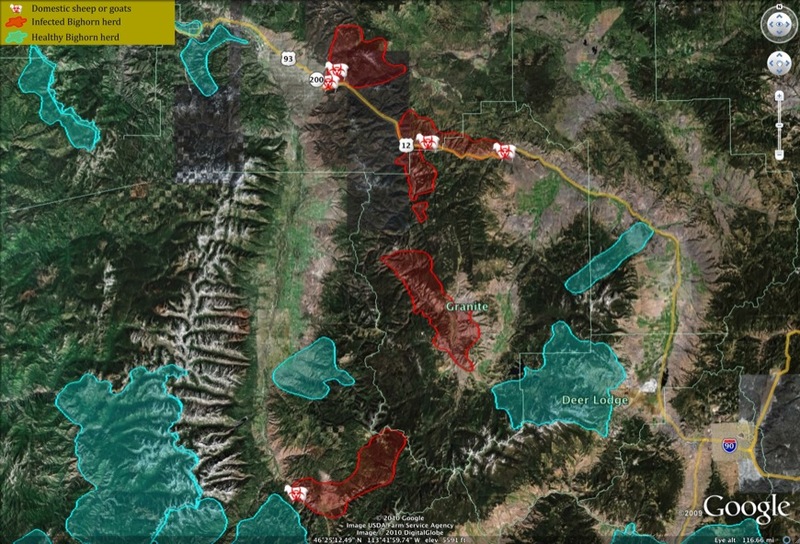 There has been no confirmed interaction with domestic sheep or goats although there are grazing allotments within a few miles which allow sheep and there has been no known movement of bighorn to these areas. In Wyoming, a herd of bighorn sheep, which has experienced disease problems in the recent past, was observed with coughing lambs. Some lambs were seen coughing which were taken and necropsied. 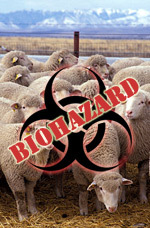 The testing found “Arcanobacterium pyogenes, but no Pasteurella or Mannheimia” and there has been no confirmed interaction with domestic sheep. In South Dakota, bighorn sheep in Custer State Park are still suffering from the effects of a die-off that occurred 5 years ago. In that incident there had been interaction confirmed between bighorn and domestic sheep but the incident was not conclusively linked to the die-off. 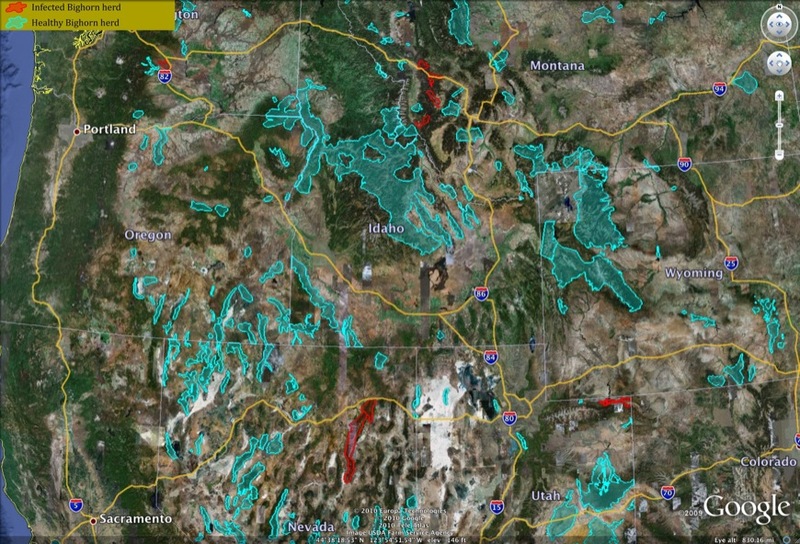 Here are a few more maps which show bighorn sheep populations and domestic sheep grazing allotments. There are numerous areas where sheep grazing on Federal lands occurs within or very nearby bighorn sheep populations. The outbreaks in MT are not near any domestic sheep allotments on federal land, or near large domestic sheep livestock producers. Pet sheep and goats associated with increased development/settlement adjacent to and on private land inholdings within public land are a possible source for disease and parasites. You are correct but it highlights the need to address the issue of farm flocks and hobby sheep in areas near bighorn sheep. It is a big problem and if it isn’t addressed the Endangered Species Act may come in to play with this issue. It seems to me that small pockets of sheep are just as infectious as large bands when they come into contact with bighorn. Fortunately they are often in fenced fields, but not always. A fence is not always a barrier either. There is a lot of resistance to addressing this issue on private lands but people can’t just stick their head in the sands and hope this goes away. Thank you for your detailed chronicling of this critical issue regarding domesticated sheep v. bighorn. Your posts are well organized and accompanied by relevant documentation. 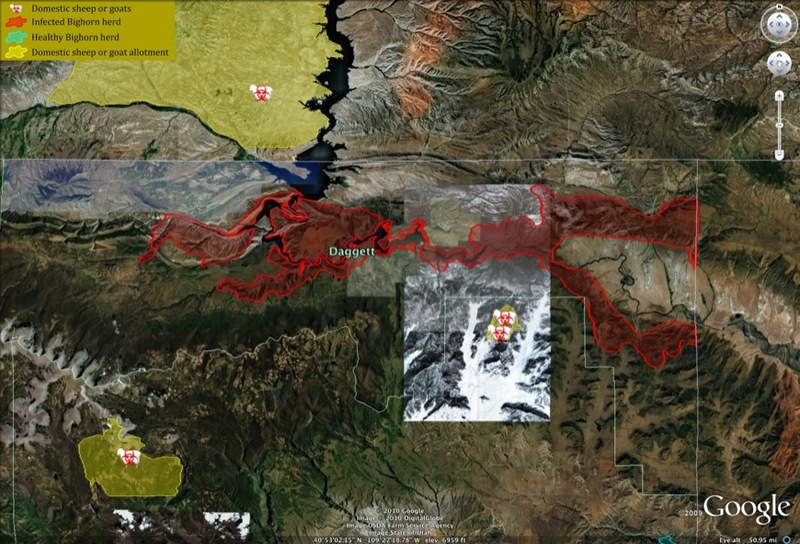 Your maps based on ‘Google Earth’ are especially helpful for visualizing the extent of the problem via the juxtapositional delineations of wild and domestic sheep ranges. Thanks for reading. This issue is one that is of great interest to me and I think it needs to be elevated so that the general public can understand it. One thing that I’ve noticed in the mainstream media coverage is a general lack of discussion about the conflict with domestic sheep and goats. It is a very real conflict that has serious implications for bighorn sheep.